There are many reasons people consider buying a bigger home (our building our dream home as we did). Often, newlyweds might purchase a “starter home” which is intentionally smaller than their ideal home, in order to save money. They figure they can buy a larger house later, when they start adding children to their family or start earning more money. Maybe you’ve decided to run a daycare or other business from your home and require more space to do it well. Whatever your reasons for wanting a larger home, here are some things to consider before purchasing a big home that will prevent you from going broke. A larger home means more expenses! Keep in mind you’ll have more expenses than just a bigger mortgage payment. Bigger homes also mean higher property and school taxes, higher utility bills, and larger maintenance and repair expenses. Other things to consider are more furniture and other home furnishings that were needed for the old house (this one got us). It doesn’t stop on the inside of the home, either. What about the outside? Do you have a bigger lawn to maintain? More landscaping? I think you see where this can go. You might also have Homeowner’s dues that you weren’t used to before. Make sure your income can support a larger home before you make the leap. Interest rates for mortgages fluctuate from week to week. The cost of buying a home varies greatly between a 4.5% fixed interest rate and a 14% interest rate. 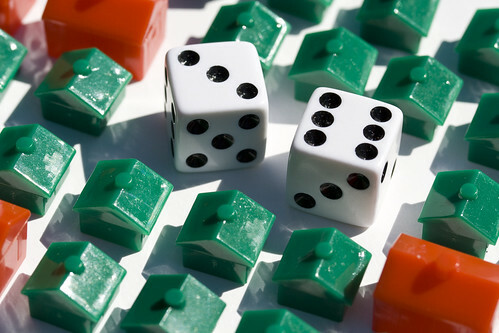 Your ability to obtain the lowest interest rate should play a roll in whether or not you look to buy a bigger home. If your credit score is not up to par, you can expect to pay a higher interest rate, and higher monthly payments than if your credit history and score are in good shape. You might want to consider renting if your credit score is low, take the time to improve your credit, and consider buying later when your credit score has improved to take advantage of the best interest rates. If you didn’t know, mortgage rates have been low for quite some time. We initially locked in a 30 year fixed rate at 5% in January 2010, which was a 1% lower than we locked in our first home in 2005. Just the other day, we had the chance to refinance to a 20 year rate at 4.375% in just under 6 months. If you’re income supports it, locking in now might make sense for you. If you’re looking to buy a bigger home than one you already have, you should first consider how much equity you have in the existing home. You can avoid a bigger mortgage payment if built up equity in your current home. When you sell the home, you can apply the profits to your down payment and lower your mortgage payments on the larger home. Remember, if you meet certain ownership tests (if you’ve owned your home 2 out of the last 5 years) a couple could exclude up to $500,000 of a capital gain on the sale of their primary residence ($250,000 if individual owner). When you start thinking about buying a larger home, you’re probably thinking about a home you intend to stay in for the long haul. Make sure to consider carefully the neighborhood you want to live in. What town would be best for you and your family? Do you need to think about school districts or how close to your work the home is? Where we actually built our new home was only two miles from our old home. You’re probably wondering, “what’s the point”? For us, we knew we needed to expand because we had another boy on the way and we know we wanted a third. Plus, the subdivision that we had bought the lot in was new and growing and was one of the only that was still “in town” and close to the new school. We felt that if we didn’t act now, we were going to miss out. We’re thankful we acted when we did. What’s the Condition of the Market? At any given time, it is either a “buyers market” or a “sellers market”. This simply means whether the market is favoring the buyers of new homes, or the sellers. Who is benefiting the most from the current marketing conditions? You want to time your purchase of a larger home when the market is in the buyers favor – as this means lowest interest rates and lowest prices on homes. This is a lot harder than it sounds. You can read the first part of our selling process in my building dream home post. Needless to say, we thought we picked a good time to sell, but it took us a few months longer than we really expected.